My name is Sivan Azouri and I am the shlicha for Young Judaea in the DC/Maryland/Virginia region. When Sharon told me that I was going for a full week of volunteering and service with teens, I was so happy. This is exactly the work for which I will wake up in the morning and smile. A focus on activism, community responsibility, giving without personal gain and service learning is what it’s all about. I came into this week with high expectations and a high level of excitement. Every day that passes, I gain so much – knowledge, inspiration and so many different points of view. It did not disappoint. It warms my heart to see the teens approach this experience with curiosity, a desire to learn and a heartfelt passion to give of themselves. It is absolutely inspiring. Take today for example. This morning, our group was split into two. 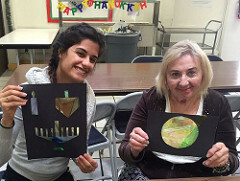 One group headed to the Westside JCC to work with children and I accompanied the second group on their visit the residents at the Israel Levin Center a Jewish home for older adults. On our way to the Center I did not know what to expect. Meeting with the elderly is not always comfortable and even at times difficult, especially for teens that have not had many opportunities to interact with the elderly beyond their own grandparents. I was so surprised when we walked in the door and there was NO SIGN of unease or awkwardness, not for a minute. The teens approached the residents of Israel Levin with such ease and the connection between the groups was immediate. The atmosphere was warm and pleasant filled with positive interactions, joy and laughter. One phrase that caught me and warmed my heart was from one elderly woman, right before we left. “This day caused me to feel young again”. I believe that something happened here that will continue into the future with the local teens as well as for future Alternative Winter Breaks. I definitely think that the Center will welcome Young Judaea back with open arms. Although this experience is for them, I am so fortunate and proud to work alongside these teens for this once in a lifetime experience. ~ Sivan Azouri is the joint Young Judaea and Tzofim Shlicha in the DC/Maryland/Virginia area.